As all of you who were there will know, last Friday’s lecture was a sell-out success and a great time was had by all. I understand Matthew and Christopher’s sales afterwards were a record! In Sheffield! I take it all back. Coming next month we have a fabulous new lecture from Paul Gordon. “One of the best lectures I’ve ever seen…” Steve Vickers, Cornish Magical Society. The Paul Gordon Close-up Magic Lecture has travelled the world in recent years. In fact, Paul has lectured in America seven times since 1994; the first being at Tannen’s Jubilee in New York. And most recently (2008) at FFFF (Fechter’s Finger Flicking Frolics) in New York. He has lectured for over 90 clubs in the UK since 1994 (including four times at The Magic Circle in London); not to mention his lectures in France, Denmark, Spain & Germany. So I reckon by now he’s pretty much got it right! Every lecture has received a ‘rave’ review! “Fantastic lecture and the very first in the new headquarters!” Alan Blythe, The Magic Circle. Paul’s lecture is entertaining and full of ‘doable’, usable magic from his books, DVDs and professional repertoire. If you think that card magic is awe-inspiring or, dare we say it, dull – you will be pleasantly surprised by Paul’s enthusiastic and energetic approach. He teaches a lot of magic – and more: Sleights, Tricks, Tips, Thoughts, Stories, Patter, Presentation, Angles, Stance, etc., with lots of laughs on the way! “Well done, Paul. Great style – great lecture!” Mike Gancia, British Magical Society. 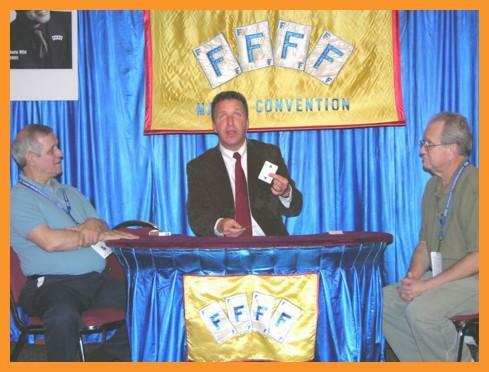 Paul performs and teaches, in a fun and informal way magic from his books and DVDs. The lecture is fun and informative, but not ‘heavy’. “Thank you Paul; it was excellent! Great card magic; great lecture!” Trevor MCombie, Edinburgh Magic Circle. Paul Gordon will be at the Magick Lounge, 82 Broad Street, Sheffield, S2 5TG, on Thursday 26 November 2009. Doors open at 7.00, lecture starts at 7.30. Make a note in your diary now! Tickets available at £10. Great video/site keep up the good work.